Re-Defining The Narrative features African American scholars, researchers and writers discussing education, access and opportunity from their perspectives. In an effort to bolster and expand the dialogue about the role education plays in the lives of all Americans, we created Living Education eMagazine. It is our goal to introduce readers to the various ways education is inseparably linked to our everyday lives. Through an exploration and examination of all educational issues relevant to parents, students, educators and political leaders, Living Education eMagazine aspires to be a key component in re-defining the social, economic, and workforce benefits associated with an educated society. Educators, parents and civic leaders from all over America have provided their voices to our discussion. 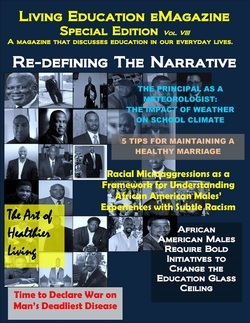 We welcome you to join the conversation and to make Living Education eMagazine a part of your educational conversation. Thanks for all you have done to expand the discussion on the value of education in our everyday lives. If you have any questions, please feel free to contact us at editor.forestoftherain@gmail.com.